While it’s impossible to accurately rank all of Moore County’s incredible assets, its location has to be near the top of the list. 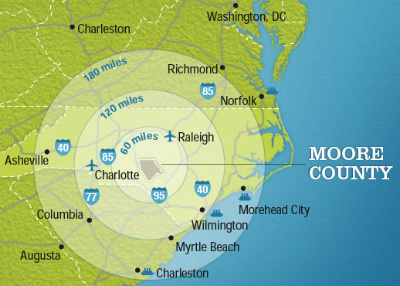 Located on the eastern seaboard, halfway between New York and Miami, Moore County sits just south of one the fastest growing metropolitan areas in the United States—Raleigh-Durham, NC. This location offers residents and businesses the best of both urban access and rural living. Here you’ve got room to spread your wings without being trapped inside the headaches and hassles of fast-growing cities, but there’s incredibly easy access to all the amenities when you need them. Imagine living on a sprawling horse farm or a multi-acre lakefront property, while being just an hour from world-class research universities, an international airport, bustling downtowns and dynamic business parks filled with some of the worlds most innovative companies. But that’s not even the half of it. 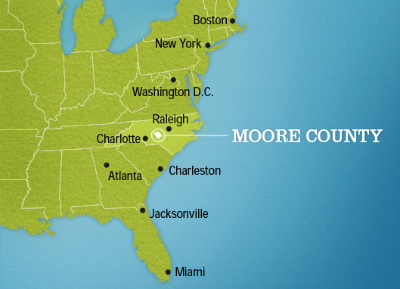 Added to everything else is the fact that Moore County is halfway between the beautiful Blue Ridge Mountains to the west, and the pristine shorelines of North Carolina’s Outer Banks. Hiking, mountain biking and snowboarding are just as easy as surfing, sailing, or deep-sea fishing. But don’t think for a second that outdoor enthusiast have to travel to enjoy the wonders of nature. That’s not even close to true. Residents enjoy strolling through Weymouth Woods, boating and wakeboarding on any number of local lakes, hunting, fishing, and let’s never forget the golf! With the Pinehurst Resort and dozens of other world-class courses in close reach, Moore County is truly the home of American golf.